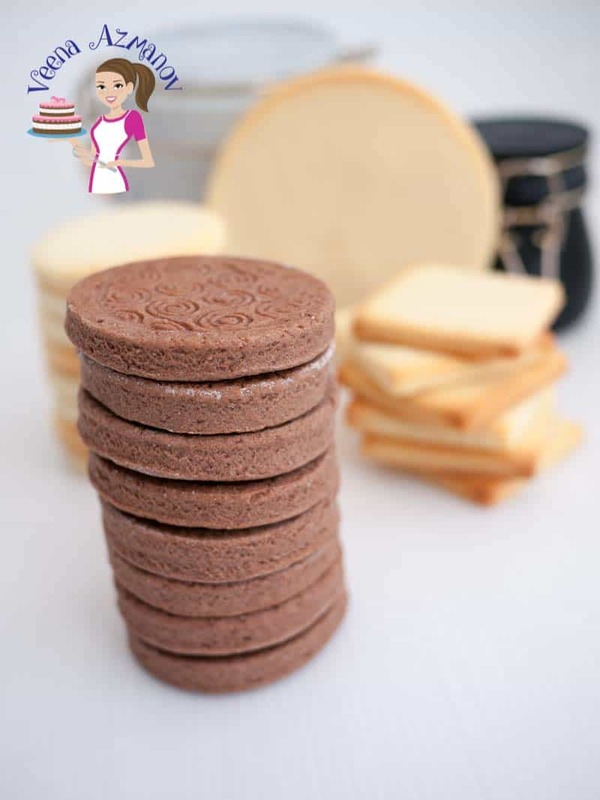 These chocolate sugar cookies are a delicious treat whether you choose to decorate them or eat them as is with a cup of coffee. Based on my classic butter cookie recipe they are soft, crisp and buttery. Also, they do not spread, making them ideal for shaped and decorated custom cookies. 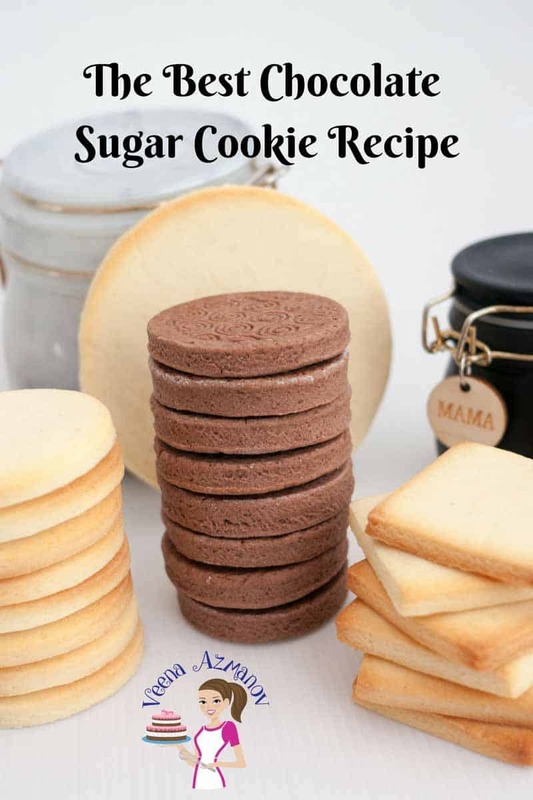 In a previous post, I shared my vanilla sugar cookie recipe with just a variation on the chocolate version. Some of you found that difficult. So, I’m just going to give you the recipe here. It’s almost the same recipe but with cocoa powder added to the recipe. This is my go-to recipe for all decorated cookie orders. Not only do my kids love to eat them on their own, but they also do not spread making them ideal for shapes and cutouts. 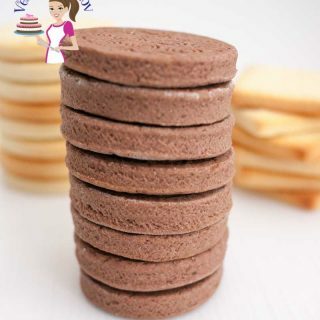 As I said, the secret to making these chocolate sugar cookies is not just the recipe but the process of how I make them. Creaming the batter well will make it more airy and light. 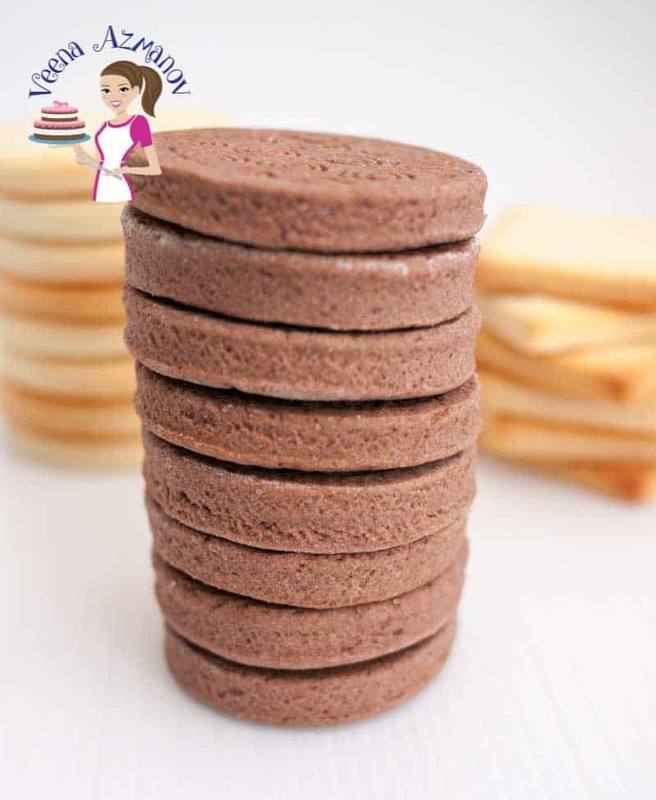 That is why though there is no leavening these cookies are not dense. If you skip the creaming you will end up with cookies that are dense and hard. 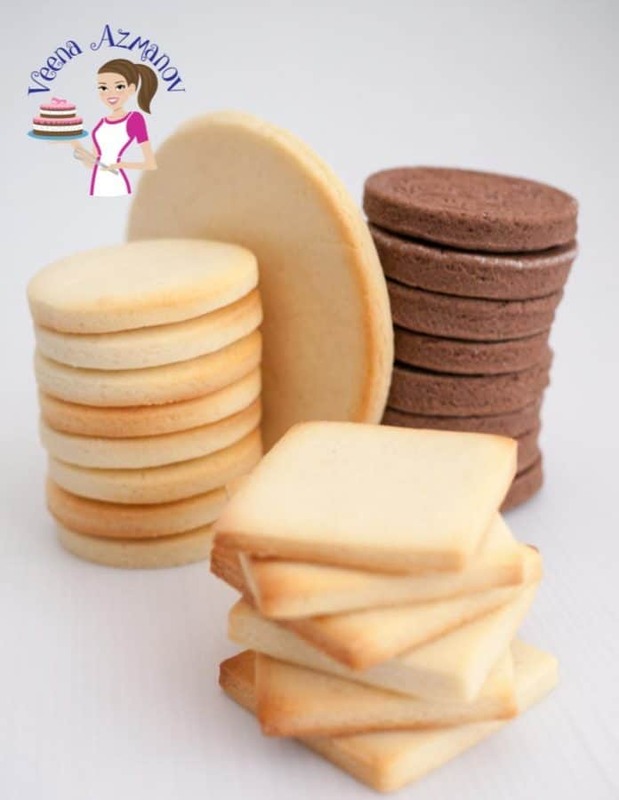 White granulated sugar – As a rule of thumb, whenever you need to cream sugar and butter – always use a fine grain sugar that will cream faster. If you have to use a coarse grain sugar – just pulse it in the food processor a couple times and it will be fine. Cookies with butter and sugar that are not creamed will result in a very flaky cookie. Vanilla extract – I like using vanilla extract. And yet, it also has the tendency to color the dough. So, if you need a white or light color dough just add clear vanilla extract or rose essence. I do have a video on how I make my Vanilla Sugar Cookies. The process is the same for these chocolate sugar cookies as well. Sift together the flour, cocoa powder, and salt. Place butter and sugar in your mixing bowl and mix on medium until light and fluffy. Do not skip this step or the cookies will be very dense. Add eggs one at a time slowly, mixing each well until incorporated. When both the eggs are added. Continue mixing on medium heat for about two more minutes. Once the dough is chilled, roll dough on a lightly floured surface evenly. I prefer to chill the cookies while the oven is preheating. Frozen for up to three months. If frozen thaw in the fridge overnight before you roll out. The baked cookies will stay at room temperature for up t 4 weeks but best eaten within a few days. Place butter and sugar in your mixing bowl and mix on medium until light and fluffy. Do not skip this step or the cookies will be very dense. Once the dough is chilled; roll dough on a lightly floured surface evenly. Top 1o Holiday Gifts for a Home Baker. HI, i love this recipe and often use it at christmas with some peppermint flavouring in the icing works like a charm. but i find the dough a little dry so i always add about a 1/3 C of milk to the mix just to get the flour to mix in better and it dosnt harm the dough at all. Thank you, Lauren. Happy you had success with this recipe and that you liked it very much too. 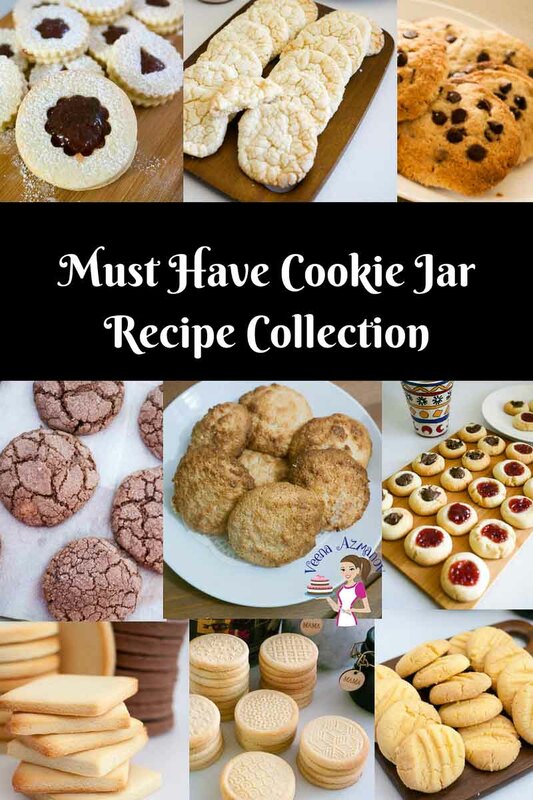 Milk is a good idea when kneading cookies if the dough is too absorbent. Every flour is different and absorbs moisture different so yes, milk or water works great in such cases. Thank you for coming back to write this feedback. Appreciate it very much. You can freeze them rolled on layers of parchment on a baking tray wrapped well. Bake them fresh a few hours before you decorate. and you can also freeze them decorated the same way on parchment paper wrapped well. Just make sure the royal icing is completely dry. Hey Tara, Sorry I have not tried these with gluten-free flour yet. I really want to though. I don’t do much gluten-free baking so my experience is limited. Wish I had some advice. If you do try it please let me know the results. Thanks so much. Hey Veena, I made theses cookies using my gluten free flour mix and they came out great! the only thing I changed was the flour! Thank you for sharing your recipe! Thank you so much, Tara. So happy to hear that. I have been wanting to make these for a while now with gluten-free. Thanks so much for coming back to write this feedback. I made cookies using your recipe. It turned out it tastes like cardboard..very hard cookie. I don’t know what I did wrong. I mixed sugar and egg really well until it got fluffy but when I mixed flour into sugary butter, the dough was a little dense. Do you think I mixed too much flour? Or over mixed it ? I will try again if you give me any suggestions. Thank you. Did you measure the flour in cups or grams? Are you aware that measurements in USA differ from those in the UK and Australia; their cup measurement is smaller than ours, so it’s best to weigh everything out in grams. I generally steer away from American recipes unless they have measurements in grams as well as cups or spoons as some recipes can turn into disasters with the different measurements. Yes, It is always best to use gram measure. The difference is very minimal though still not negligible. US cup is 240 ml while UK and AUS is 250 ml. In a small batch of cookies, the 10 grams should not have made a difference to her unless she multiplied the recipe considerably. I try my best to give as much exact measure as possible. 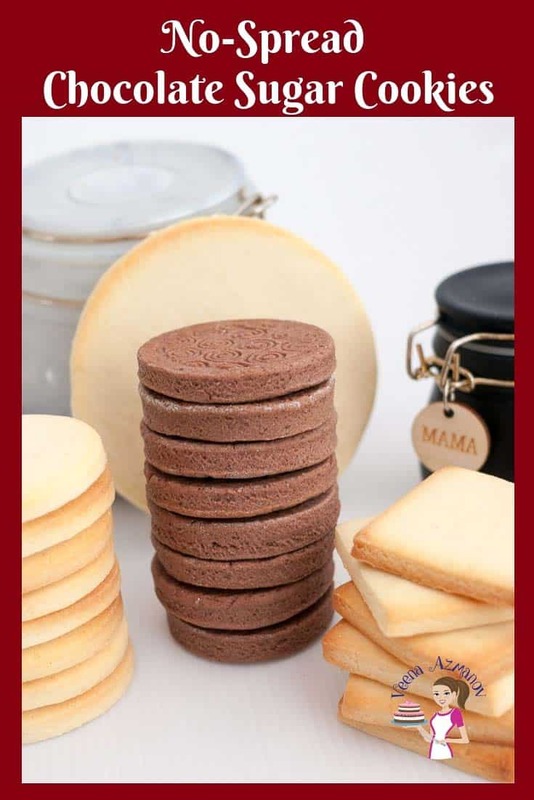 Hi Veeneza – I am so excited to try your chocolate and vanilla sugar cookies for Christmas this year. How thick do you roll out your cookies when making them for clients? Would 3/8 be too thick??? And how long would you bake a thicker cookie??? Thank you for sharing your talents! Hi Veena. I’m going to make some chocolate sugar cookies for Halloween and found your recipe. I just have one question… you say to sift the salt with flour and cocoa powder but then mention to cream it with the butter and sugar. I’m a little confused as to where I should add the salt. Thanks! Hi Veena, just to confirm- is it 330g flour as opposed to the 3300g listed? Thanks! Ahhh!! Sorry.. thanks – yes it was suppose to be 330. I guess people understood cause no one ever complained or had issues. Thanks so much for letting me know.. I really love your work! Trying out cookies for the first time. Please help me with a vegetarian version of the chocolate cookie. Hi Pallavi, I do have an eggless version of this recipe coming up soon. Need to test it once more before I post it.